Whether or not the danger has been averted, whether there really is a flicker of light at the end of the tunnel: in short, whether there are solid grounds for the stubbornly optimistic view of many capitalists that the crisis is almost over or whether this is simply a way of taking “people’s” minds off things, only time can tell. However, it is certainly convenient for many to see (or pretend to see) a lantern every time there’s a flicker of light, deluding themselves that the darkness is not so black as they’d once thought. Then again, wasn’t it that master of propaganda, the incomparable President of the Council (1), who happened to say one day that the crisis is only a psychological problem? According to him, if everyone pretended the crisis didn’t exist and kept on spending and squandering a dangerous bout of pneumonia would turn into a harmless cold. The superficiality of such notions provokes embarrassment when they are expressed in such a vulgar way but basically, once the typically theatrical figures of speech of the “premier” are removed, this is the accepted wisdom of a wide section of the serious bourgeoisie - reformists included, naturally - who see the re-launch of consumer spending and maintaining wage levels as the principal means for getting out of the difficult economic situation. For those who have the job of starting this re-launch it is not so easy - and the right and left bourgeoisie disagree about how to do it - given that the crisis has exploded with such devastating force precisely because for the past thirty years or more the international bourgeoisie has followed exactly the opposite course with a policy of progressively restricting the market, that is the masses’ capacity to consume. In other words, the systematic lowering of wages both in the capitalist metropoles and in the periphery. But this fierce attack on wages is not the outcome of a simple political choice based on the nastiness of the bourgeoisie who, at a certain point, have chosen to ransack the pockets of the proletariat almost as if they had grown tired of the so-called “Fordist compromise” and its relatively secure and decent wages. On the contrary, the roots of the market turbulence are to be found where the commodities which finish up on the market originate - in the sphere of production with its antagonistic social relations between capital and labour power. Capital only survives and develops at the expense of labour power. So long as things are going well it is capable of conceding the famous crumbs to the wage slaves (in fact, this is to their direct advantage); but when, as a result of this antagonism, things start to go badly - and sooner or later they must go badly - the only option is to attack those who are dependent on wages and the weakest strata in society to try and pump oxygen into a rate of profit (the heart of the system) which is having increased difficulty breathing. Thus, just as imperialism is not one policy amongst many for this or that bourgeoisie, a defect of capitalism, but is capitalism’s very mode of being in our epoch, in the same way the intensification of exploitation is such a vital necessity that capital cannot permit itself to ignore it if it wants to at least try to hold up the degenerative course of its illness. Redundancies, temporary contracts and permanent job insecurity, reduced purchasing power of wages, these are the indispensable weapons paraded by the capitalists over the last thirty or more years which, together with the “magical” power of money (2), that is financial speculation carried to paroxysm, was supposed to revitalise the world economy. Thus, if the tendency for the average rate of profit to fall has been slowed down or temporarily neutralised by such counter-tendencies, it has not been annulled. These are the underlying reasons for the deteriorating conditions amongst which the proletariat - and even part of the petty bourgeoisie - is obliged to live, in Italy and throughout the world. Is it an accident that in July 1993 the general agreement on labour contracts was signed which accelerated and intensified the socalled settlement? Obviously not, as some left members of CGIL (4) more or less openly admit, without however drawing the obvious conclusions. This same union has tried to quantify the loss of purchasing power for wages/salaries. Payments have all gone up: but only for the murky benefit of taxation trickery. In essence, not only has the slice of the cake allotted to the proletariat (which made the whole cake) been reduced, but there has been a big increase in the number of mouths whose teeth are biting into that slice. On the other hand, as we have mentioned, this is a global phenomenon. It could not be otherwise, given that capitalism “reigns” over the whole planet. 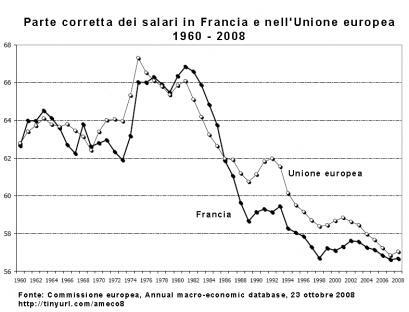 Perhaps the only difference is to be found in the sharpness of the proletariat’s diminishing share which in Italy is particularly acute. An examination of the data on wages’ share of GDP reveals the same picture everywhere, the only difference being the amount. Once again, then, capitalism has not forgotten its own interests and by devaluing labour power, that is lowering wages, it has one of the most powerful means - perhaps the most powerful - to offset the tendential fall in the average rate of profit. Without going into details, it is illuminating to compare the measures employed by capital in the 1920s and the strategies adopted today. In Germany in 1924, after the defeat of the last - badly prepared - revolutionary onslaught, working hours were extended to 10 hours per day and wages were reduced. In the United States during the “Roaring Twenties”, the frenetic years of expansion in consumption based on debt and financial speculation, the average wage clearly fell or else, in the “best” case, remained unchanged. This is because, no matter how large the mass of surplus value that is extorted by every means possible from the working class (12), this must always be related to the whole of investment capital and in the end cannot be enough to adequately remunerate capital, thus beginning the downward phase of the cycle and all the measures designed to lift the rate of exploitation, increase that notorious competitiveness of firms, until in the end they rebound against the system in general. “Old Karl” noted ironically that every capitalist aims to lower the wages of his own workers while he would like to see the wages of others increase in order to sell at a lower price - at a competitive price! - on a strong and expanding market. And today the capitalists all over the world are doing and hoping for exactly the same things. However, once the vicious circle of the crisis started it wasn’t so much that “private vices” have become “public virtues” but rather they are generalised “vices”, i.e. part of the sharpening of the crisis itself. In the same period an ILO report (International Labour Organisation, agency of the UN) drew a picture of the outlook for the future which has so far been confirmed. According to the ILO, worldwide unemployment would grow in 2009, from a minimum of 18 million people up to, in the worst hypothesis, a maximum of 51 million people and the advanced countries would not be the last to be affected. And, what’s happening in the Bel Paese? Even though Italy is fortunate in having a President of the Council with the miraculous powers of a medieval king, things are following the same general tendency. Official unemployment, which stood at 6.2% in 2007, has now increased by a further 1.8%. According to official figures, the building sector has lost 250,000 jobs but the existence of the black economy, which is prevalent in this sector, makes an exact calculation impossible. The play within the play is that the most affected, obviously, are immigrant workers who in some areas, such as Lombardy, comprise around half the workforce in building. For immigrant workers as a whole and obviously not only building workers, the decline in available jobs means the loss of residency status and the grim prospect of being pushed into living and working clandestinely. The point is that many immigrants have been in Italy for years - forming the backbone of the labour force in many factories - and have families and children who go to school here. Aside from the loss of wages, which is no small thing, it is not difficult to imagine the huge problems that losing the legal right to remain would bring. Although the CIG is undoubtedly a significant social insurance scheme - even if it doesn’t pay out the 80% of salary that the bosses and politicians claim but more like 60-65% (which means a breadline income) - in any case it includes no more than 50% of wage workers at any one time (around 7.5 million people; all the others, not to mention casual and temporary workers, are excluded from this scheme). Now, it’s true that the government and especially the regions have designed some more tin pot schemes for the unemployed and unprotected workers but, being optimistic, this still spells widespread poverty, if only because they expressly do not cover wide areas of insecure jobs and unemployment (see, for example, the agreement drawn up between the region of Lombardy-the bosses-unions). Returning to the field of social security protection. The CGIL predicts that in 2009 there will be a million more unemployed, while the more optimistic Confindustria (the bosses’ organisation) says 600,000. The fact is that, so far, according to the CGIL, 400,000 temporary workers have not had their contract renewed and on top of this can be added a further 200,000 public employees who are set to lose their job in the next two years as a result of the targets set by Minister Brunetta, whose anti-statist fervour is reminiscent of an old cartoon figure, a drunken superhero for the rich who robs the poor in order to further enrich his protected few. It takes the bloated face of a union bureaucrat to say these things without blushing, seeing that it was the unions who signed every one of the agreements designed to weaken and dismantle the old pension system (i.e. the robbery of final salary pension schemes), pushing and eventually forcing workers to subscribe to private pension funds, managed, at least in part, by the unions themselves. If we didn’t know these types we would be disconcerted as we remembered the arrogance and derision met out to anyone who criticised their activities at the union meetings which they’d called to lure in the workers with their fantasy about the advantages of pension reform. Now what are they going to propose in the face of this massive disaster? The usual idiocies. Empty calls for greater financial control, for more equal wealth distribution, for a sense of moral responsibility by institutions. In short, they make out that the beast of the market can be tamed when, however, it is not tameable. The market is a monster and only obeys the demands of profit, and in fact, of the highest possible profit: that is its nature. All the rest doesn’t matter in the slightest. It is an illusion. Despite all the possible countermeasures which have been taken over the last thirty years to increase the amount of surplus value extorted and provide an adequate amount for the valorisation of capital; amongst them and not least, the lengthening of the working day, the results for the (real) process of accumulation have been far from brilliant. However, it is already the case that at least half of wage earners (workers and employees with “permanent” jobs and legally registered) work more than forty hours a week (24) and this phenomenon is certainly not peculiar to Italy. Granted, the “productivity problem” in Italy is due - as economists of various persuasions maintain - to the fragmented productive apparatus, i.e. the abnormal presence of small enterprises whose only hope of Capitalist Crisis maintaining competitiveness is by pushing down the cost of labour or rather turning the screws on the working class. On the other hand, industrial restructuring, the introduction of new, higher “performing” machinery, leads in general to the expulsion of labour power and, thus, for the proletariat it’s a situation of falling from the frying pan into the fire. In the long term this is also the case for capitalism itself because it narrows the basis for valorisation. Certainly, during the upward part of the accumulation cycle, the comparative reduction in labour power (in relation to the capital invested) is accompanied by real growth but, at the moment, there is no sign of this on the horizon. Here then is the source of the “doggedness” of capital towards its workers, who must be continually more flexible: about wages, hours, shifts, their entire life. For the proletariat it means a leap backwards fifty, hundred or so years, but with a difference: today the proletariat is atomised, with no hope of a better future, subdued by the historical delusion of the collapse of “real socialism”, intoxicated by bourgeois ideology, by a consumerism (in the West) which has led it to ape the lifestyle of the petty bourgeoisie. These disagreeable facts are responsible not only for the loss of class consciousness, but also for the decline in simple class identity, which has undermined workers’ will and capacity to struggle, something for which we also have to thank the political operations of the unions and parties “of the left”. Last, but not least, it is thanks also to the absence of a revolutionary political reference point. Up to now the class response to the capitalist offensive has - with some exceptions - come nowhere near the level of the attacks. ... have deteriorated further since this article was written. This only confirms what this article argues - that, as the FT puts it “wages and benefits have decelerated”. In August 2009 official UK unemployment stood at 2.49 million. 1 in 6 households are now without a wage earner. (1) The official title of Italy's head of government is Presidente del Consiglio dei Ministri, literally “President of the Council of Ministers”, usually referred to in English as the “Prime Minister”. In other words, Silvio Berlusconi, well known outside Italy for his media empire, constant ability to escape prosecution for corruption, famous advice to the survivors of the L’Aquila earthquake to pretend they were camping and seedy philandering with prostitutes and minors. (2) Hjalmar Schacht, Hitler’s creative minister in charge of the economy, wrote an apposite book entitled, “Money Magician” in order to strengthen the illusion of the bourgeoisie that money in itself can magically create more money, more wealth, by leapfrogging over the process of production of commodities and therefore of surplus value. Quoted by Ester Fano in “The capitalist countries from the world war to the crisis of '29” in AA.VV. The Crisis of Capitalism in the 1920s, De Donato, 1978, p.99. (4) Italian General Confederation of Labour (CGIL) with a membership of over 5.5 million. (5) Agostino Megale, director of the IRES, the research centre of CGIL, reported in Il Manifesto 28-03-2009. (6) Paolo Ciofi, Voyage Around Working Italy, [Viaggio nell’Italia del lavoro] CalicEditore, 2008 p.33. (7) Luciano Gallino, La Repubblica, 09-01-2009. (8) Michel Husson, “The Tendency for the Rate of Exploitation to Increase” [“La hausse tendencielle du taux d’exploitation”] in Un pur capitalisme, Editions Page Deux, 2008. (9) Devi Sacchetto, “Mobility of the Labour Force and Capital” [“Mobilita della forza lavoro e del capitale”] in AA.VV. La Lunga Accumulazione Originaria, Edizioni Ombre Corte, 2009 p.148. (10) Leon Sartre The Marxist Theory of Periodic Crises [Theorie marxiste des crises periodiques] Ed. Marcel Riviere et al ,1937, pp 38-40. See also “Considerations on the Composition and Recomposition of the Class with Globalisation” [“Considerazioni sulla composizione e ricomposizione di classe nella mondializzazione del capitale”] in Prometeo #6, 2002. (11) Geminello Alvi, A Republic Based on Revenue [Una repubblica fondata sulle rendite], 2006 p.60. (12) Amongst these means are the non-compliance with the most elementary safety standards at work, so much so that in Italy between 2003 and 2006 there were more workers killed than American soldiers in Iraq: 5,252 as against 2,978. Even though this phenomenon particularly distinguishes the bloody character of Italian bosses (see also the recent Safety report [Testo Unico sulla Sicurezza], it is part of a growing tendency world wide. According to the ILO there were 2,200,000 deaths at work in 2004, 200,000 more than in the previous year. Furthermore, for every fatal “accident” there were four deaths as a result of workplace diseases and, to finish this list of crimes by the bourgeoisie and its lackeys, in the same year there were 270,000,000 nonfatal “accident” victims. Figures reported in P. Ciofi op.cit. pp 104 and 109. (13) Luciano Gallino, “Decline of the Union, Between Crisis of Representation and an Uncertain Future” [“Declino del sindacato tra crisis di rappresentanza e sfide future”] in Nuvole, #34, October 2008. 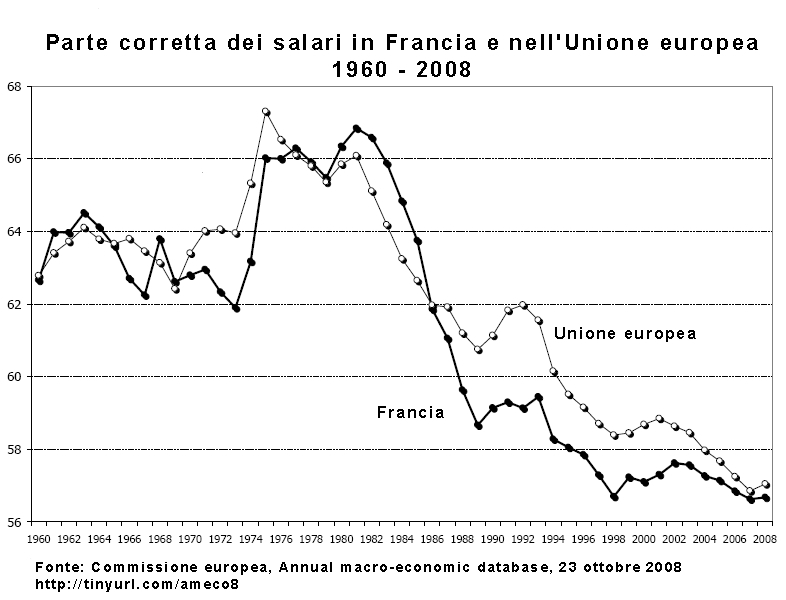 (16) Figures from the OECD, reported by Il Manifesto of 08-04-2009. According to the ILO workers in the black or “informal” economy could soon make up 53% of the entire labour force and the working poor , 1.4 billion; in China alone it appears that the number of unemployed forced to return to the countryside from where they came is at least 20 million. (17) 4 million workers were forced to go over to part time working after the subprime bubble burst in 2007. 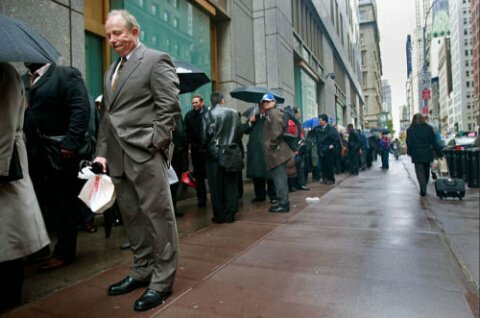 The total number of unemployed and underemployed would appear to be about 23.1 million people. See Charles-Andre Udry, “Emplois: la chute la plus rude depuis les annee 1930-31” [Jobs: the sharpest fall since 1930-31] in alencontre.org visited 16 March 2009; see also Il Manifesto 4.4.09. In May the official unemployment rate was already over 9%. (18) Amongst the unofficial welfare supports (i.e. which are not part of the cassa integrazione [Italy’s official system of putting workers into a holding pool for redundancy payments, trans.] or unemployment benefits) first place is without doubt the family which nowadays supports thousands of “big children”, that is youths who cannot leave the family home because their income is either too low or they do not have an income. In any case the mid-May report by the governor of the Bank of Italy, Draghi, (attacked by the ineffable premier) indicated that 2.6 million workers were totally, or almost totally, without any social welfare benefits. Of these at least 1.6 million are in danger of becoming unemployed or, which is the same thing, of not having their contract renewed. For a more detailed picture, see the article by F. Piccioni in Il Manifesto of 06-06-2009. (19) Il Manifesto, 01-05-2009. But even these figures, gathered during the editing of this footnote, have been surpassed with the revelation by Eurostat at the beginning of June that unemployment is now 9.2% of the workforce. Within this bleak framework Spain and Greece are distinguished by a growing countertendency, that is a very small increase in employment. Whether this is due principally to the various government programmes or to a real change in direction for the economy is yet to be seen, but given the present state of things the first hypothesis is the most likely. (20) rassegna.it visited 18-05-2009; this page said that the number of metal workers in cassa integrazione was between 450,000 and 500,000, i.e. 25-30% of the whole group. (24) Figures from CGIA de Mestre, reported by Il Manifesto, 04-01-2009. From Episodic Resistance to Global Class War? Power – the fundamental question of the State in Capitalist Society.